More than 40 parishioners of the St. Louis Catholic Church have found a different way to grow spiritually and personally. It's called Eucharistic Adoration. 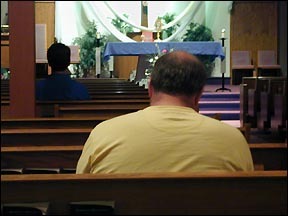 On the surface, it appears to be a group of people who pray one hour each for 24 hours straight, beginning every Thursday morning after 8 mass. They sit in silence, one or two per hour - even in the middle of the night - and pray to bread that was blessed during mass. But the power of prayer runs deeper than what the surface conveys. "There's more happening with our collective consciousness than we can possibly understand at this time," noted Molly Zimmerman, coordinator of the Adorations. Eucharistic Adoration holds different meanings for each individual person, but one belief is shared by everyone - that Jesus is present. "The Eucharist is the real presence of the body of Christ, under the form of what was bread," explained Father Liesen. "Christ is present." 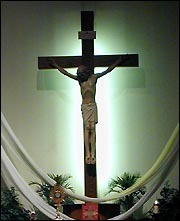 The Eucharist is ordinarily contained out of view in a tabernacle, but during Eucharistic Adoration it is displayed with a gold monstrance, which resembles rays of sunlight. Upon arrival for their hour of prayer, each person adds their prayer intentions to an extensive, hand-written list in a book that dates back to January of 2000 - when Adorations were first held for 24 hours in Paynesville. Eucharistic Adoration provides a way for people to spend one hour per week in silence and get in touch with themselves and Jesus - free of the distractions of today's busy world, said Zimmerman. Everyone spends the hour differently, added Zimmerman. Some choose to read, some choose to pray, and some just want to slow down the pace of their life for an hour. At left, the body of Christ - under the form of what was bread - is displayed in a gold monstrance, which resembles rays of sunlight. Like sunlight, Christ's presence is shared with everything around Him. Zimmerman benefits from having an internal dialogue with Jesus. "It's a chance to talk with and listen to Jesus, " she said. "When you have to make a decision and you feel like you need the help of Jesus, what will that answer sound like?" Praying with Jesus during Adoration helps her become more aware of His presence in everyday life. "Half of prayer is listening," emphasized Mary Ann Fasbender, a member of the coordinating committee. During her hour, Fasbender prays for intentions in the prayer book, for numerous worldwide intentions, for the forgiveness of society, and for things that are heavy on her own heart at the time. Richard Macht, who shares an hour with his wife, Nancy, described the feeling of intimacy with the Lord that he gets during Adoration: "When you go to mass, you're in the congregation, and the Lord is there. But in Adoration, it's like you're one-on-one." "It's a great sense of peace," added Nancy. Kathy Frandson coordinates the hours from midnight to 8 a.m., and she gets a different perspective on the city during that time. "Paynesville is different in the middle of the night - everything is closed and dark," said Frandson. "It took me a while to learn to relax," she admits, but with time she has grown comfortable. "Never has there been any record of anything negative happening to anyone coming or going at night," she added. Frandson spends her first half hour in traditional prayer, and the rest of the time she listens silently. "I need to learn to spend much more time than I usually do just being quiet - not praying, not adoring - but just listening," she said. "You feel His presence when you can just stop and listen," she continued. "He knows our needs without us saying a word." Zimmerman also mentioned how it is comforting to just sit in the presence of Jesus. She offered an analogy: "You like your dog not because he talks to you, but because he's simply there and he shares his presence with you." Some people are so at peace that they fall asleep. "How wonderful," said Frandson. She wishes she was that comfortable with Jesus, but knows the day will come when she will be. In the same way that the experience of Adoration is different from one person to the next, said Zimmerman, it's also different from one time to the next. "It's like when you see a friend - sometimes you don't do very much, and sometimes you work on a big project," she explained. Anyone can participate in the Adoration, even if they are unable to commit to a certain time every week. Guests may simply stop in on their own or contact Molly Zimmerman if they are interested in a weekly hour. People of all religious denominations are welcome to participate.